Mr Punch – the most famous puppet figure of all time. 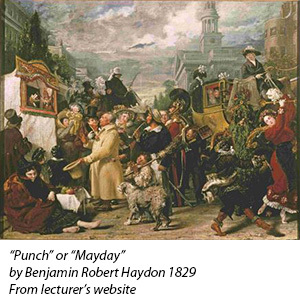 His comic irreverence gave “Punch” magazine its title, and his anarchic vitality has inspired opera, ballet and punk rock. His enduring popularity has seen his likeness on goods ranging from Victorian silverware to video games. N.B. This lecture will follow our AGM which will start at 10.30am. One of the most derided towns in England, renowned for its dullness, Basingstoke is distinguished only by its numerous roundabouts and absurd Modernist architecture. Rupert explains that the post-war planners, who inflicted such features as “the Great Wall of Basingstoke” on the town, were politically motivated and bent on destroying all traces of its past. He reveals the nobler Basingstoke that is buried beneath the concrete, and the few historic gems that have survived. It is a story that neatly illustrates the ugliest episode in England’s architectural history. 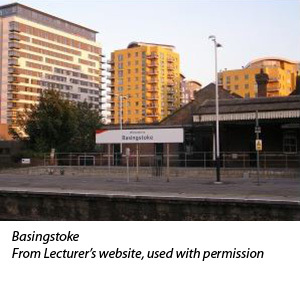 As Betjeman wrote prophetically, “What goes for Basingstoke goes for most English towns”. 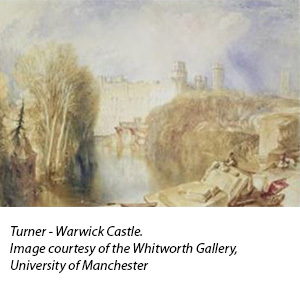 It is just over 600 years since the birth of this enigmatic painter. His grave, solid figures set in a timeless landscape and lit by a clear light, encapsulate the harmony of man and his world that was at the heart of Italian Renaissance thought. But they are, in fact, a perfect fusion of the influences of the North and South, of light and logic, which reflect his native countryside while yet conveying a spirituality that reaches out over time and boundaries. 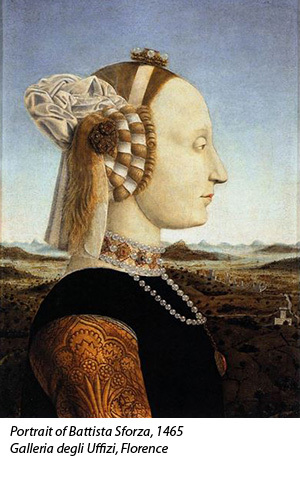 Whether working for the church or his patron, Federigo da Montefeltro, his paintings radiate serenity and timelessness. Religion has been the inspiration for many of the greatest buildings of the world. 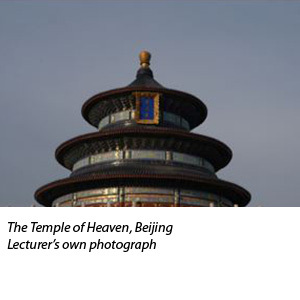 Indeed for much of human history the stories of architecture and religion were synonymous. We will move from early societies such as Mesopotamia and Egypt before focussing on the living faiths: the great continuities of Buddhism and Hinduism, and the revolutionary changes brought about in monotheistic Judaism, Christianity and Islam. This lecture tied in with our Society’s trip to Provence in April. In her richly illustrated lecture, Juliet explained how the development of the French railway network in the mid nineteenth century encouraged artists to leave Paris and join fellow artists working in such areas as Provence. Features of the work of the newcomers included using more vivid colours. 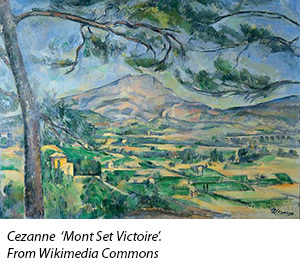 Besides examining the work of Cezanne, van Gogh and Gaugin, she introduced the audience to local artists including Leo Lelee and Monticello. 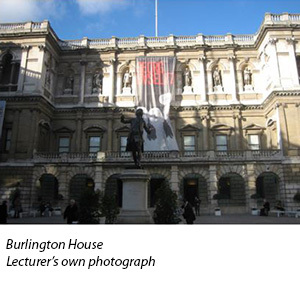 We will look at the position of artists before and after the formation of the Royal Academy in 1768, and some of the characters involved, from the first President Sir Joshua Reynolds to more oppositional artists such as Gainsborough and the initially clandestine Pre Raphaelite Brotherhood. As with any important institution the Academy has been embroiled in intrigue and controversy over its history and no scandal or outrage will remain unexposed. Warwick Castle remains one of Britain’s best preserved and most popular medieval castles. The walls were raised by the Earls of Warwick who took a leading role in the most important events of Medieval England. In 1604 the castle was transformed into a fortification and a luxurious stately home. The Earls of the eighteenth and nineteenth century filled the castle with a wealth of paintings, furniture, arms and armour and objets d’art. This lecture will introduce us to some of these undiscovered treasures. 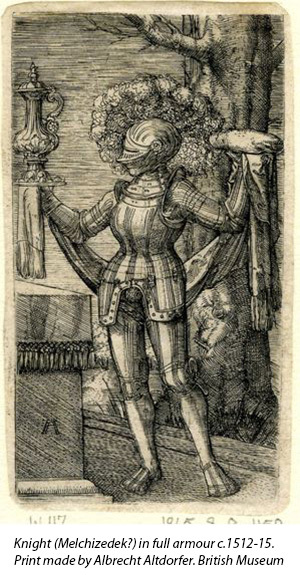 Armour was one of the great Renaissance art forms, but it is often overlooked. In the fifteenth and sixteenth centuries almost all the richest and most powerful noblemen could be counted as dedicated patrons of the art. This was an intensely personal art, both expressive and decorative. It also demanded great skill in the sculpting of iron and steel as well as mastery of complex decorative techniques. The end result embodied more complex messages about status and the social order, divine power, and attitudes and identities. Franz Liszt was a cosmopolitan figure – he even visited Leamington Spa –but with the rise of Hungarian nationalism he was increasingly seen as the soul of the Magyar people, a position solidified with his wildly popular Hungarian Rhapsodies. 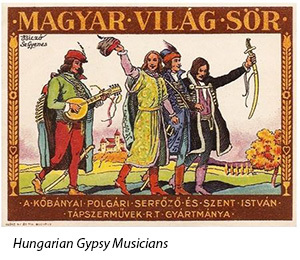 Why did Liszt and others associate Hungarian music with gypsies? This lecture explores what it was to be Hungarian at the time of the creation of the new capital city of Budapest in 1867, and why the much younger Bartok challenged his view of the Hungarian national style.